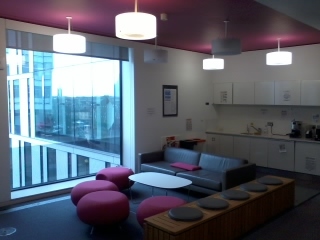 A wee bit of graphical encouragement to minimise use of power in the Forum & Bayes building over the break. 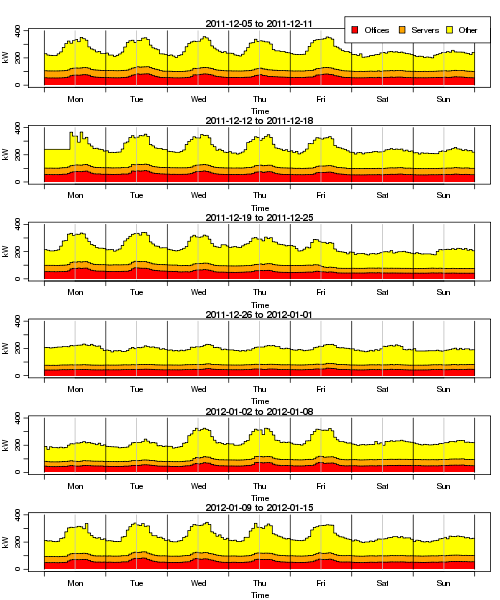 The dips in electricity consumption every winter vacation can be seen in this graph of electricity consumption in the Forum (and now Bayes too – click for larger version). So please follow the Winter Shutdown advice: ensure windows are closed, blinds are down (especially on street-level windows) and equipment is powered-off, where possible. Feel free to shutdown your desktop – you should be able to wake it up remotely even if you have powered it off. Heating will be reduced in the Informatics Forum and Bayes, during the closure period; however the heating buttons on each floor will work and will a provide a one hour boost. 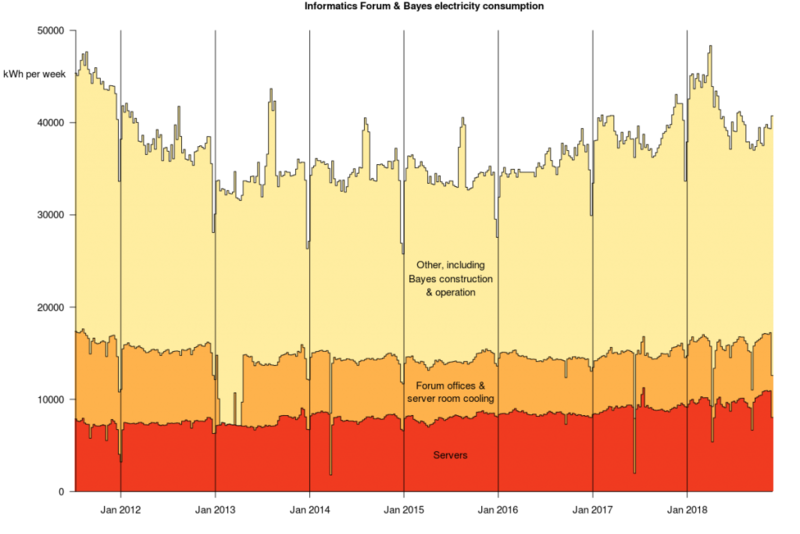 After a period of relative inactivity, prompted by being interviewed by the Social Responsibility and Sustainability Department, I’ve produced a plot of the electricity use in the Forum from July 2011 until now. July 2011 is when logs start from the Forum UPSs, which allows the electricity use to be apportioned between Servers, Offices (basically anything that runs from a socket in an office or seminar room) and Other (ventilation, lifts, lighting, dishwashers, microwaves, coffee machines &c.). The graph reflects changes we’ve made to systems in the building quite nicely. There are actually more than a million readings – actually 1,589,728 – which I’ve now munged so that they’re almost all available from a SQL database. There is also a (at present poorly documented) R package that allows for easy querying and plotting of the data. It also does the work of extracting real power from the UPS logs – the Office UPS only supplies apparent power, so I’ve converted to real power using a power factor of 0.9, estimated from the Server UPS. Not included in the UPS power is the overhead required to run each UPS. Let me know if you’re interested in the data or the package. I’m looking for volunteers to help me test some energy-saving software.You will need to have a DICE computer already allocated to you. 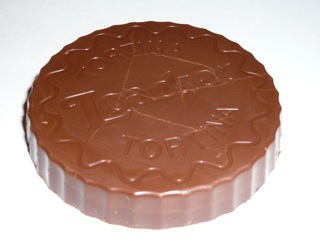 Your reward will be the satisfaction of helping to reduce the School’s energy consumption, but in case that’s not enough, the first dozen people to respond can also relieve me of a Tortina chocolate biccie (“a heart of smoothest cream from the finest hazelnuts captured between two light and crisp wafers and then wrapped in exquisite milk chocolate”). If you already have a DICE computer and you’d like to help, please replytelling me its name. I’m not aware of any remaining bugs in the new version of lcfg-sleep, and it’s been running for some time now on computing staff desktops. However I’m not quite so sure whether it has the best possible configuration. I’d like to fine tune it to make sure that it doesn’t annoy people too much, for instance by being too quick to make the computer sleep. If you take part, your duty will mainly be just to tell me what you think of the new sleep behaviour, especially if it annoys or inconveniences you. If you spot anything wrong please tell me about that too of course. If you’d like to help please reply telling me the name of your DICE machine. Thanks. And thanks to Chris for working on this. The test system has been running well for me for about a week now. Image released under a Creative Commons Attribution Non-Commercial Share-Alike license by Chocablog. This Climate Week, come along to find out what staff and students across the University are doing about climate change, ranging from energy efficiency in buildings, to setting up a food co-operative, and discuss what we want to make happen next. Contributions will include short presentations from David Somervell (Sustainability Advisor), Sarah Lang (Hearty Squirrel Food Co-op), David Sterratt (Energy Coordinator, Informatics Forum), Max Crema (Vice-President Services, EUSA), and others. There will also be plenty of interactive discussion with everyone involved. There has been a long standing problem in the Forum whereby pantry area lighting is tied to the main stairwell lighting and the areas are being unnecessarily lit at night. Work is due to begin this coming Thursday (24th Jan.) to place the pantry area lights on a separate circuit with individual PIRs. This will stop them coming on with the stair lights but will bring them on if anyone enters the area in the evenings. The work will involve annexing an area usually reserved for seating and the corresponding area on the floor above. The areas will usually be out of operation for two days at a time. Normal access to the sink and associated facilities will be maintained but the seating will be limited. 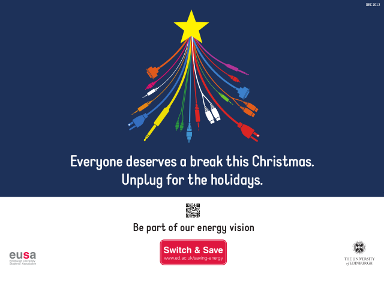 Apologies for the inconvenience and thank you for your patience whilst we and E+B try to limit unnecessary energy consumption within the Forum. Here’s advance notice of the Festive switch-off as it applies to Informatics. use over the Xmas break. If you think you may want to remotely access your desktop over the holidays, log out […]. You can wake the machine again by going to wake.inf.ed.ac.uk. Self-managed machines can also be awoken using this mechanism – contact support for details. Note that logging out will allow your machine to sleep. Putting it to sleep using System->Shutdown…->Suspend from within a graphical session doesn’t work completely yet – if the machine wakes again, it won’t go back to sleep. The comprehensive documentation on sleep explains more. Can we do better than last year? 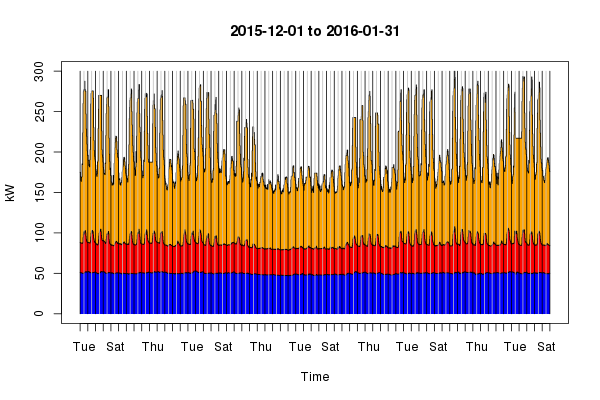 Last year, the data collected from the main meter showed that in the quietest week of the vacation we managed to reduce the total electricity use by about 23% on a typical week (Table 1, below). 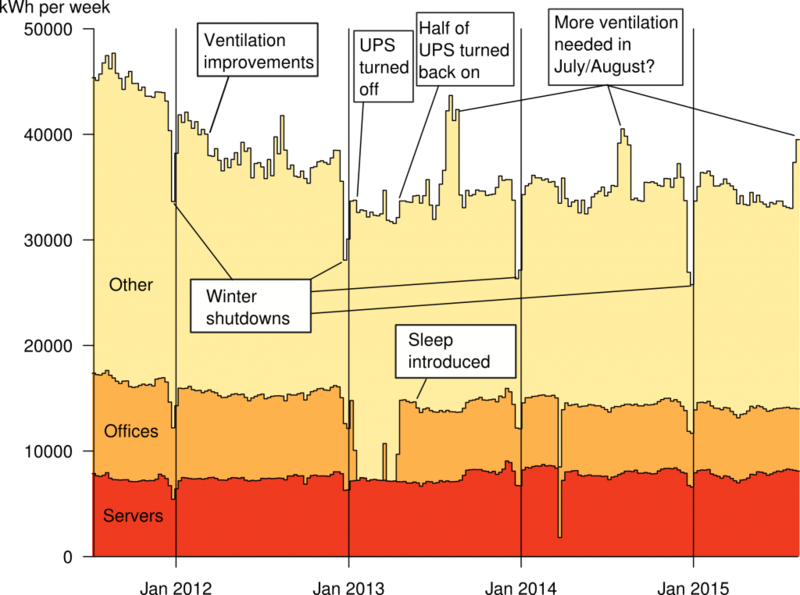 Data collected from the UPS systems showed that power used by offices was down by about 27% and server electricity was down by 28%. 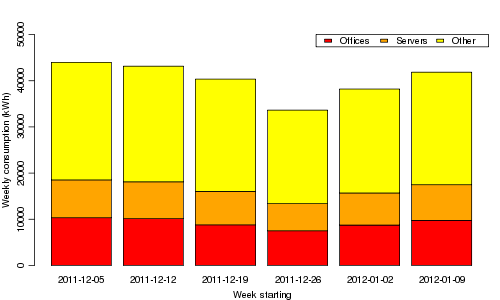 However the baseline usage (the minimum in any week) was down by only 21% for offices, as opposed to 26% for servers (Table 2). It would be great if we could get the baseline down lower this year.